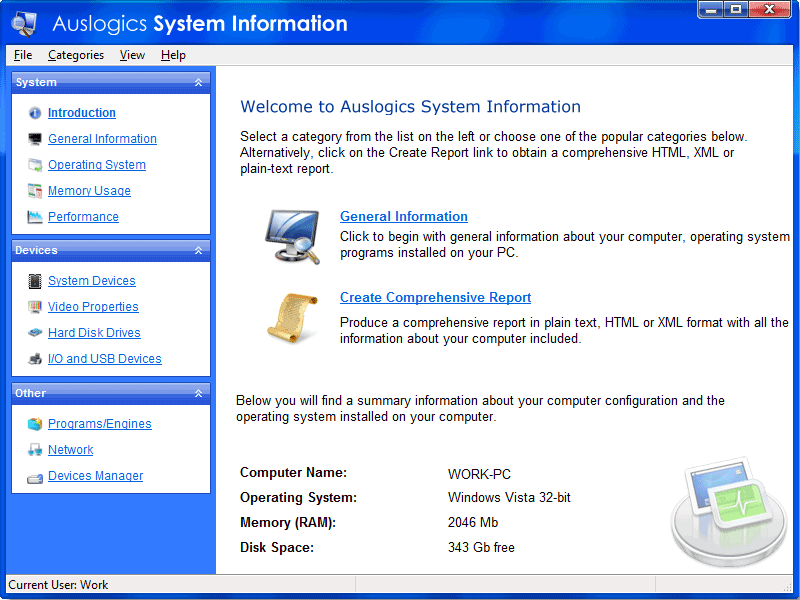 Auslogics System Information provides you with computer and Windows details, installed devices, running processes and services, memory and CPU usage and other information. You can explore details of your computer hardware, disk drives, processor, video card and monitor. It is much easier to use and understand than the built-in Windows system information tool. Neatly arranged tables with system details, visual diagrams and charts will help you evaluate the current status and performance of your computer and operating system. Should you need to send details about your computer to the technical support of your ISP or computer manufacturer, the program can help by generating a comprehensive report in HTML, XML or plain text formats. The program is 100% Vista and XP compatible and supports the latest devices from the leading hardware manufacturers, such as Intel, AMD, NVIDIA and others. With System Information from Auslogics, you will have all the details about your computer at the tips of your fingers. RAM Saver Pro - Easy-to-use RAM optimizer tool that will keep your computer running faster. It increases the operation system performance by making more memory available for your applications. CheVolume - Per-application volume control. Assign applications sound outputs. You can choose where the audio of your applications go. Active@ Data Studio - Active@ Data Studio provides a range of desktop applications and a customizable boot environment allowing you to access your PC in the event that Windows won't start up. It offers data recovery, secure erasure, disk imaging and more. Red Button - Red Button is a powerful tool for optimization and cleaning your Windows PC. System Monitor Pro - This is an easy-to-use software utility that continuously shows the CPU, memory, disk and process usage, the network traffic, the sound and battery levels and the current time. All these percent values are displayed on eight large dials. RoboTask - RoboTask allows you to automate any combination of tasks on your computer, ranging from simply launching applications, to checking email, moving or backing up files to uploading/downloading, sending email and much more. SPListX for SharePoint - SPListX for SharePointis a powerful application to export document / picture library contents and associated metadata and list items, including associated file attachments to the Windows File System. TwinkiePaste - TwinkiePaste is the utility to quickly typing commonly used text, dates, greetings, standard dates, greetings, standard responses, Internet URLs, logins and passwords, code templates. TwinkiePaste helps to quickly type text in almost any application.